One of the most unpleasant things about asphalt is its ability to deteriorate to the point where an asphalt lot may look like overrun and desolate, despite being less than a decade old. When asphalt is exposed to the UV rays of sunlight, it goes through several stages of degradation: first comes discoloration. Then comes deterioration – piles of sand begin to appear and the lot starts to look rough. In later stages, bigger rocks fall out, leaving room for dirt, grass, and weeds to fill in those spaces, making your lot unpalatable to look at or drive on. Asphalt is also incredibly weak when it comes to resistance to salts, chemicals, and petroleum products. Like sunlight, these products can cause severe damage to asphalt, namely in the form of structural damage. 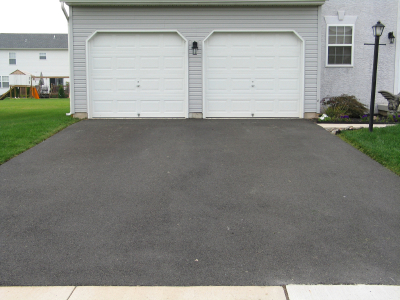 An asphalt lot can easily become unstable and soft after an oil spot, a gas spill, or more. So how do you combat the eventual degradation of asphalt over time by environmental and chemical conditions? That’s where seal coating asphalt comes in. To make the most of your investment, it is best to seal coat asphalt from the get go. Too often, people try to fix the problem after the damage is done, when it could have easily been avoided during the paving process. It may mean more money upfront, but seal coating asphalt can lead to a significantly improved lifetime: up to three times the span of an uncoated property. The way seal coating works is it acts as an impermeable barrier between the asphalt pavement and the external harmful elements. A good seal coating will be highly resistant to water, gas and oil, salt, chemicals, and UV radition. Rather than an unsightly lot with overgrown weeds, sealcoating your lot can give you that perfect blacktop that will reflect your company’s commitment to professionalism. If you have any questions about sealcoating your asphalt, or to get your free quote today, give us a call at 410-768-4720 or contact us via our website today. AMC specializes in the cleaning and general maintenance of outdoor areas, commercial and industrial, throughout the tri-state area. Specifically, the upkeep of sidewalks, curbs and building facades, plus the installation and care of street furniture, and all sanitation disposal. This entry was posted on Friday, May 23rd, 2014	at 8:28 pm	and is filed under Paver Patio	. You can follow any responses to this entry through the RSS 2.0	feed. Both comments and pings are currently closed.